Music theatre lovers rejoice! The sea of revivals has parted to deliver a bona fide world hit, and the Australian production is a dream come true. 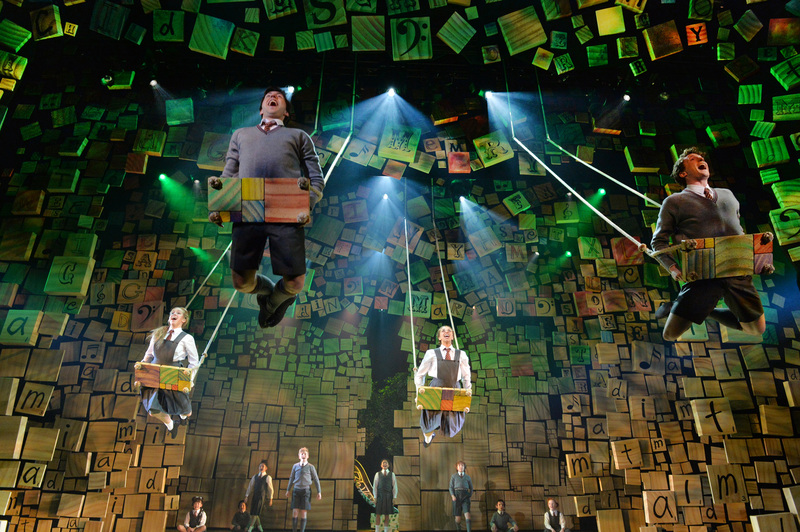 Wickedly subversive, endlessly inventive and as funny as it is moving, Matilda is sheer joy for adults and children, boys and girls alike. Dennis Kelly’s book deftly sidesteps the inherent risk of saccharine sentimentality in children’s stories with elements of horror and fantasy on par with the qualities have ensured ongoing affection for films such as The Wizard of Oz and Willy Wonka and the Chocolate Factory. Speaking of the ‘Wizard’ of Oz, Tim Minchin’s music and lyrics would be cause for celebration in the most experienced of composers; from a music theatre newcomer they are nothing short of extraordinary. Kelly and Minchin avoid another all too common trap by treating the audience’s intelligence with respect. Enhancing Roald Dahl’s magical tale, Kelly has added a mystical thread in Matilda’s storytelling. No spoilers here, except to say that careful listening will be well rewarded. Just as we witness the birth of Elphaba in the opening sequence of Wicked, so we see Mrs Wormwood, worried she may have wind, go to hospital and give birth to Matilda. While the horror of Elphaba is her cabbage-green skin, Matilda terrifies her parents with her love of books and disinterest in television. Sent to Crunchem Hall with a batch of little Miracles, Matilda spellbinds the librarian with her imaginative storytelling, earns the affection of dear Miss Honey and leads the revolution against the hideously tyrannical Miss Trunchbull. A terrifying literary creation if there ever was one, The Trunchbull derives a level of gleeful malevolence in following rules and doling out punishments not seen since the original Joan Ferguson. Director Matthew Warchus displays his penchant for magical stagecraft whilst also grounding the larger than life characters with just the right amount of truth and humanity. Storytelling is crystal clear, despite the deceptively large abundance of details to take in on first viewing, and diction is clear and precise. Rob Howell’s ingenious abstract design houses specific scenes with a minimum of props against towering walls of scattered play tiles. If your gaze wanders for a moment, there are all sorts of words and symbols to find spelled out in the seemingly chaotic design. With a scope that fits the mighty Sydney Lyric space perfectly, the scale of production is grander here than in London’s Cambridge Theatre or Broadway’s Shubert Theatre. Howell’s costumes are a cavalcade of colour and cheeky details, from the hefty bosom of Miss Trunchbull (looking just like Quentin Blake’s illustrations) to Mrs Wormwood’s garish mix of hot pink and electric blue. Nifty touches include The Escapologist’s top hat of chains and locks and Mrs Phelps’ layers of colourful beads. 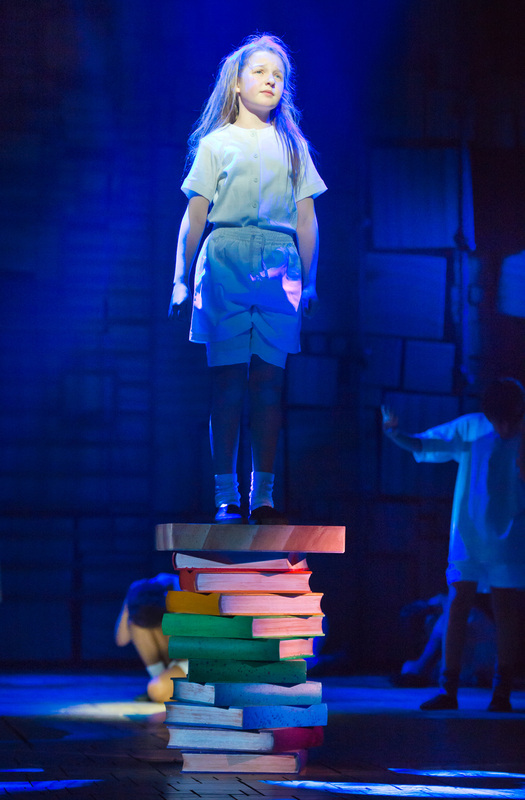 A segment that highlights the level of collaboration in the creative team is the use of the alphabet in “School Song.” Cast members perform Peter Darling’s choreography as they climb Howell’s school gate singing Minchin’s alphabetised lyrics as they place lettered tiles into the set pinpointed by Hugh Vanstone’s lighting. Much as Oliver! and Annie are seen as musicals full of child actors, the material for children in those shows can only be described as token compared to the riot of singing and dancing by the young cast of Matilda. Darling’s demanding, energetic choreography is a thrill to behold, and the children sing with hearty gusto. 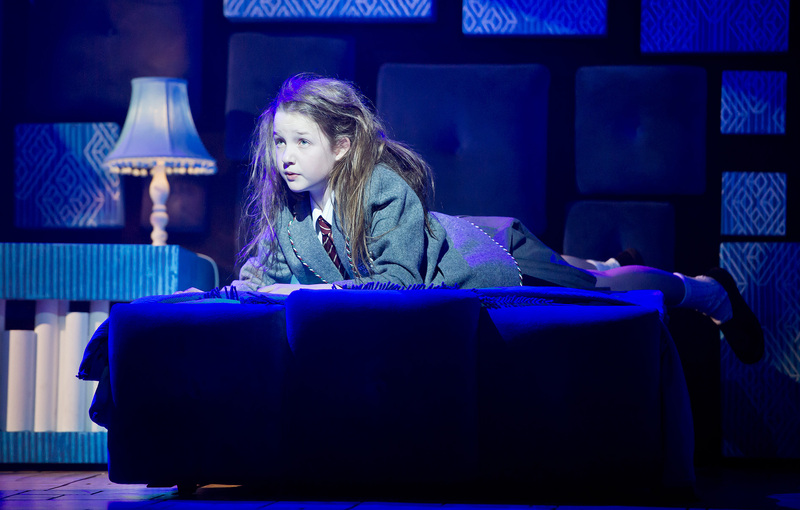 On opening night, Matilda was played by Bella Thomas, a young actress who is winsomely mature beyond her years. A tirelessly strong singer and actor, Thomas’ expressive face changes from resolute to vulnerable in a heartbeat, easily winning her the heart of every audience member. Upstaged by the sensational child actors, and surely not begrudgingly so, the adult actors are splendidly cast and give high-octane performances. James Millar is a sheer delight as the deliciously hideous Miss Trunchbull, wickedly whispering her insidious threats and demands with a subtle but infectious twinkle in his eye. Delivering act two’s showstopper to end all showstoppers, “The Smell of Rebellion,” Millar channels a bit of Merman mixed with his own inimitable style. Elise McCann is a wonderfully endearing Miss Honey, giving the character just enough plucky resolve beneath her timid exterior. Blessed with a warm middle register as well as sweet high notes, McCann’s singing is a pleasure to hear. Marika Aubrey is electric as the deeply shallow Mrs Wormwood, spitting out her lines with gleeful venom. Daniel Frediksen gives an almost vaudevillian comic performance as the decidedly stupid Mr Wormwood. Cle Morgan is warm, earthy and quirky as loving librarian Mrs Phelps. Matilda is sure to be a white-hot ticket in the months to come. Fingers crossed that a Melbourne season will be announced shortly. 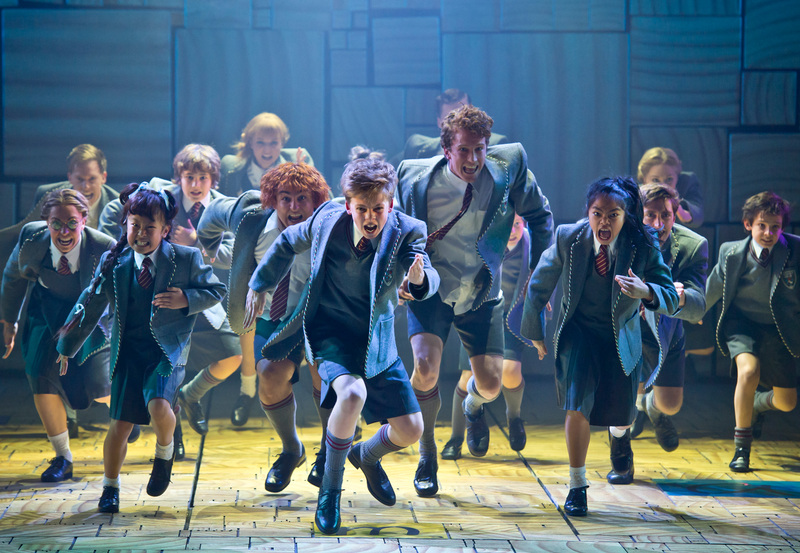 Matilda the Musical plays at Sydney Lyric Theatre, currently booking until 29 November 2015. Man in Chair also reviewed Matilda the Musical on the West End and Matilda the Musical on Broadway. Roald Dahl wrote the book …..Libretto perhaps? Good point Jenni – the two terms are very similar. I suppose I would use the word “libretto” for the text of an opera, but the term “book” is usually used to refer to the spoken dialogue (and overall structure) of a musical, which I what I was referring to by “Dennis Kelly’s book…” Ronald Dahl, of course, deserves infinite credit for writing the original novel, the source of all this highly imaginative creativity. Matilda The Musical, Melbourne was loud. The diction by the Matilda today, there are four in all, was too hard to decipher with her irritating English accent and fast pace. There is no memorable melody and the acting is forced and unprofessional. The set becomes tedious. A totally hyped up show……so disappointing. Sorry to hear you didn’t enjoy Matilda Sally. I agree that the lyrics are a little fast to fully hear clearly at first listen but I do find the tunes very catchy. Expensive tickets to leave at interval but I guess if you are not enjoying it there is not much point staying. I hope you have a more positive experience the next time you go to the theatre.